Age Limit: Candidates age should be 35 to 50 years for Post 1, 2, 30 to 45 years for Post 3, 25 to 37 years for Post 4, 7, 25 to 35 years for Post 5, 6, 8, 9, 10, 21 to 30 years for Post 11 as on 05-12-2017. Age relaxation is applicable by 5 years for Scheduled Caste/ Scheduled Tribe, 3 years for Other Backward Classes (Non Creamy Layer), 10 years for Persons with Disability (PWD) candidates & others as per rules. recognized university. For more information refer the notification. Selection Process: Candidates will be selected based on Group Discussion (GD) /Personal Interview/Psychometric Test. Application Fee: Candidates should pay Rs. 100/- for SC/ ST/ Persons with Disability (PWD), Rs. 600/- for GEN/ OBC candidates by online using only Debit Cards (RuPay/Visa/MasterCard/Maestro), Credit Cards, Internet Banking, IMPS, Cash Cards/ Mobile Wallets. 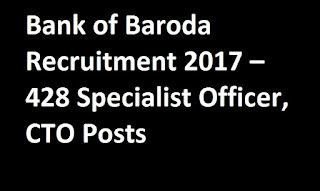 How to Apply: Eligible candidates may apply online through the website www.bankofbaroda.co.in from 14-11-2017 to 05-12-2017. 3. Click on Careers ——–> Career Opportunities. 4. Select the desired post &n click on online link given in the notification. 5. Fill all the details carefully & submit form. 6. Take printout of online application for future use. Last Date to Apply Online & Payment of Fee: 05-12-2017. Foe more details like reservation, experience and other information click on the link given below…. Educational Qualification: Candidates should have Engineering Graduate in Computer Science/ Information Systems/ other related fields or MCA or equivalent qualification from a recognized University/ Institution with relevant experience. How to Apply: Eligible candidates can can send their application through email: recruitment@bankofbaroda.co.in on or before 24-11-2017. Mention the Post Name in the subject line of email. Foe more details like compensation, experience and other information click on the link given below….